Oops. 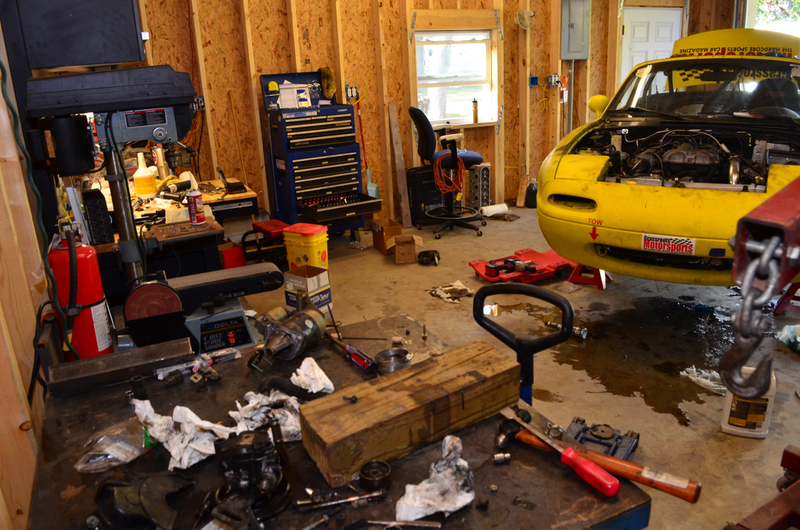 After dropping all its oil, our Miata's engine was down for the count. 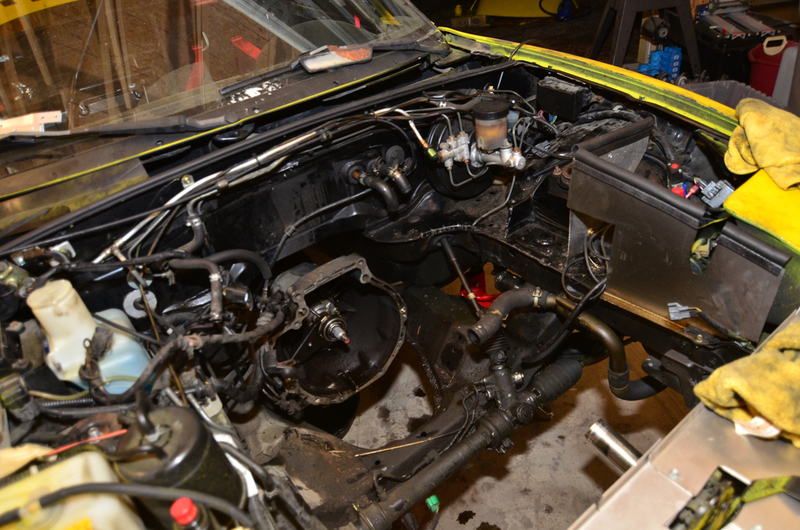 Pictured: Not what you want your engine bay to look like days before the big race. 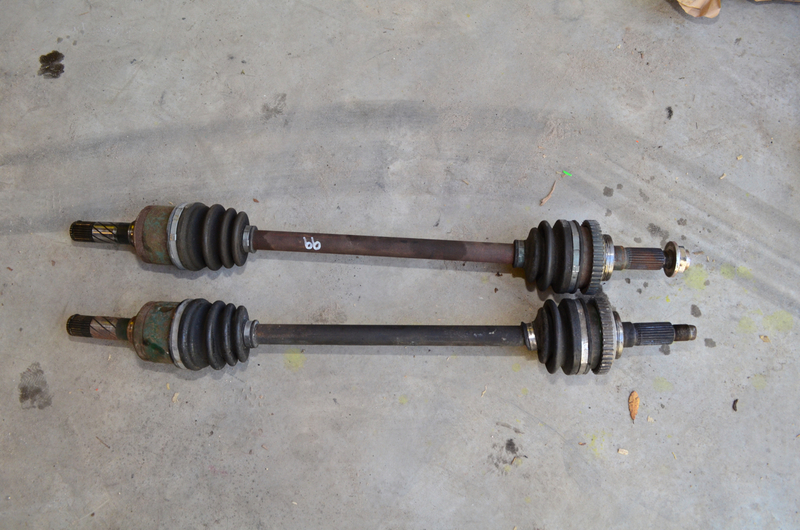 From left to right: The spare 1.6 that we thought was a 1.8, the blown 1.8 that was in our race car, and a Chevy V8 that we were sorely tempted to cram in with a welder while we had the tools out. Fortunately, Treasure Coast Miata came through with a good used 1.8. It only took us a few hours from phone call to new engine in our hands. 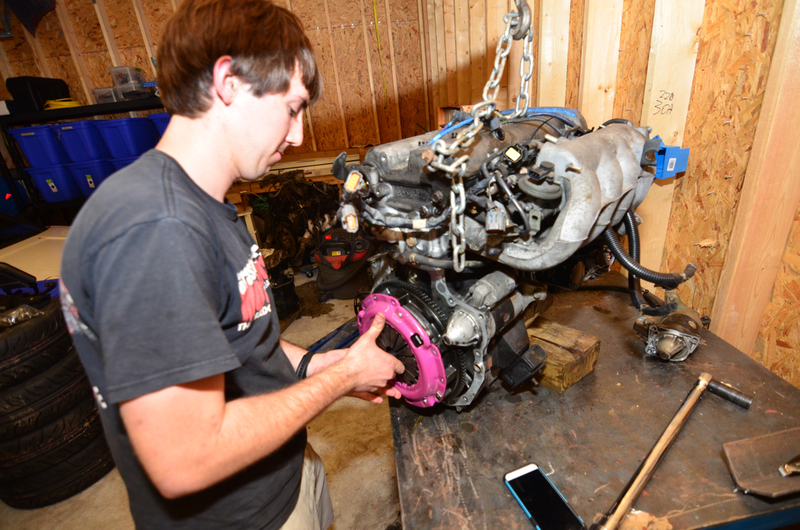 We transferred the accessories from our old car, like the starter, CAS, and Flyin' Miata clutch and flywheel. 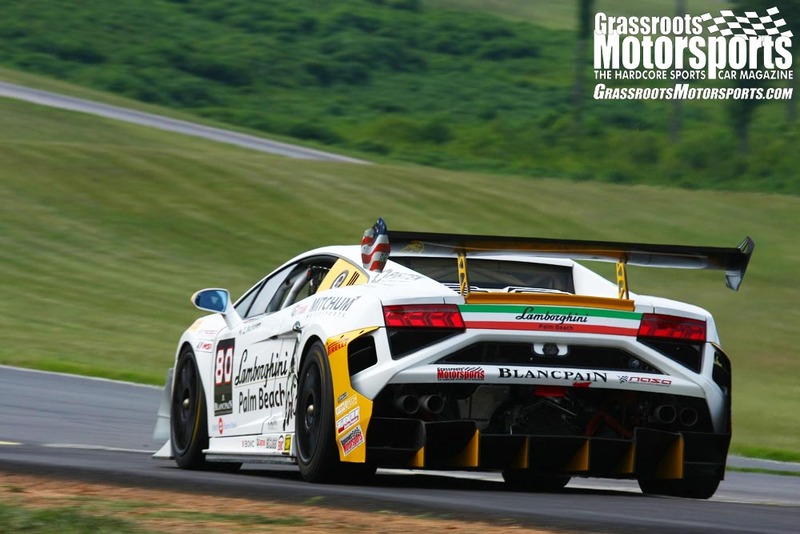 We also threw a volley of basic maintenance at the new engine, since we didn't want to waste a race entry due to a broken timing belt or a leaking water pump. Treasure Coast Miata had all of the new maintenance parts in stock, too. 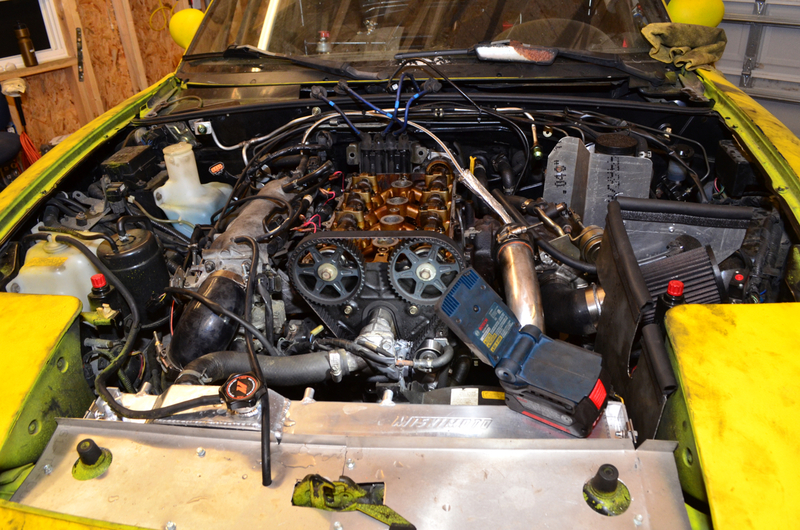 Also on the to-do list: add a turbo oil return line to our new engine's oil pan. 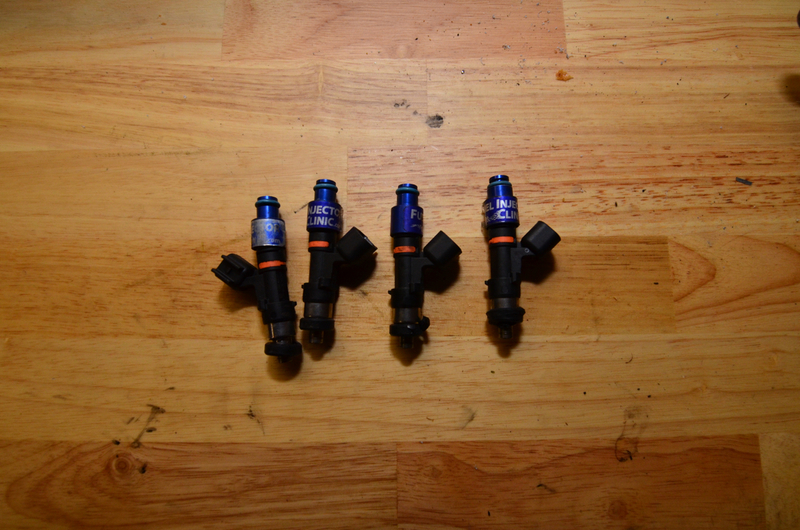 We also made sure to swap our larger Fuel Injector Clinic injectors over to the new heart. As the manual says, installation is the reverse of removal. It was time to start connecting things. 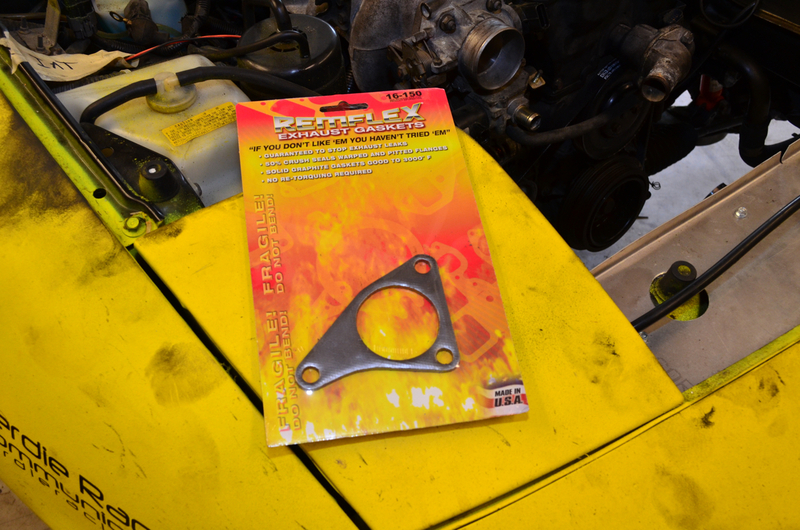 We're hoping this Remflex exhaust gasket fixes our persistent leak between the turbo and manifold. 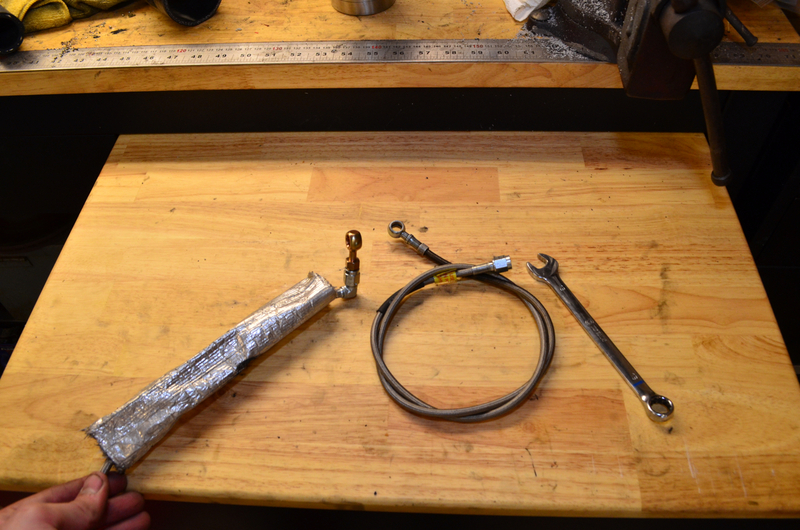 The cause of the last engine's demise: Our turbo oil feed line melted. We're hoping that a slightly different routing and a strong dose of insulating wrap will cure this issue. 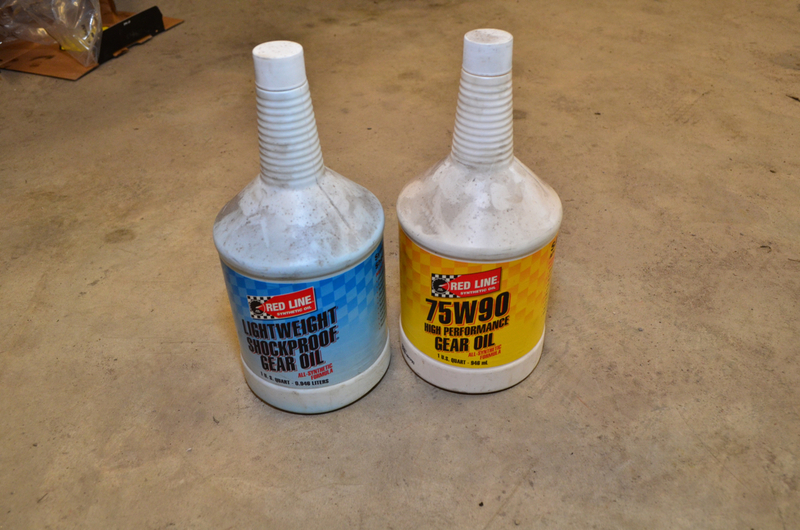 That looks much better–no more oil line-on-exhaust action. 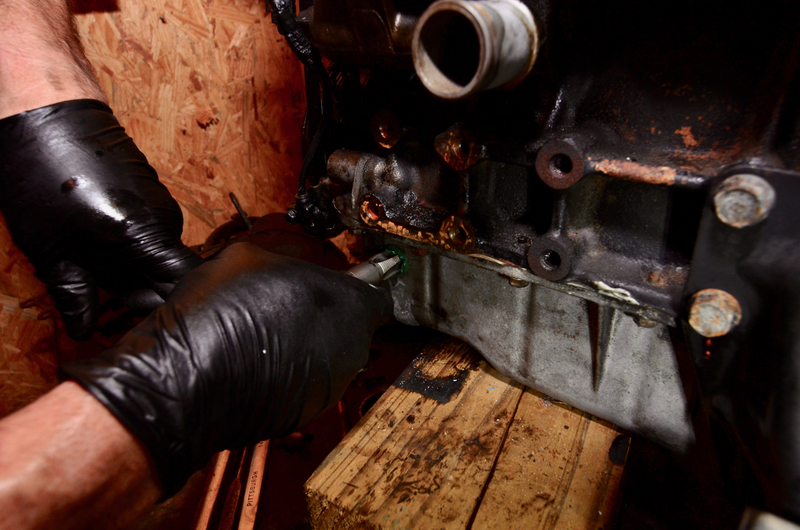 While we had the engine out, we changed the transmission and differential oil just to be safe and to check for wear. Redline's magic sauce seems to be keeping everything happy. 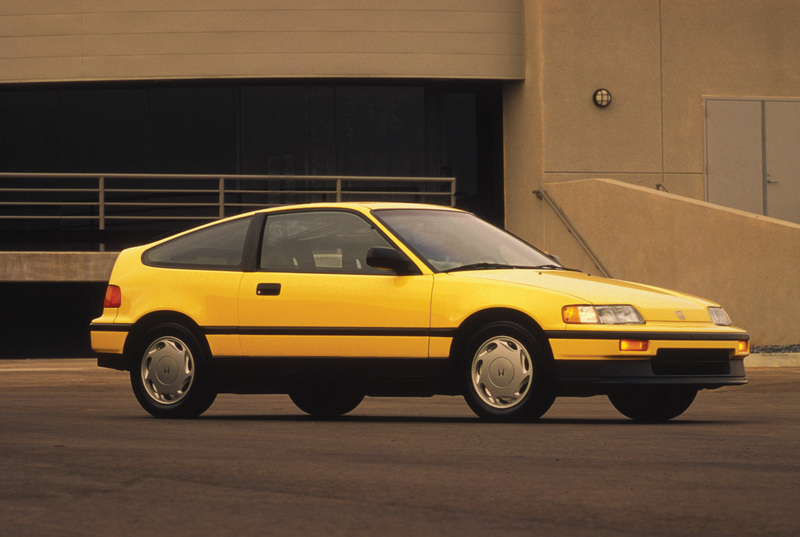 We did notice one torn CV boot, though. 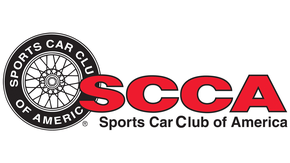 Treasure Coast Miata supplied a few used replacements. Oh no! Before we could start our new engine, water started pouring out. We dove back in to find the issue. 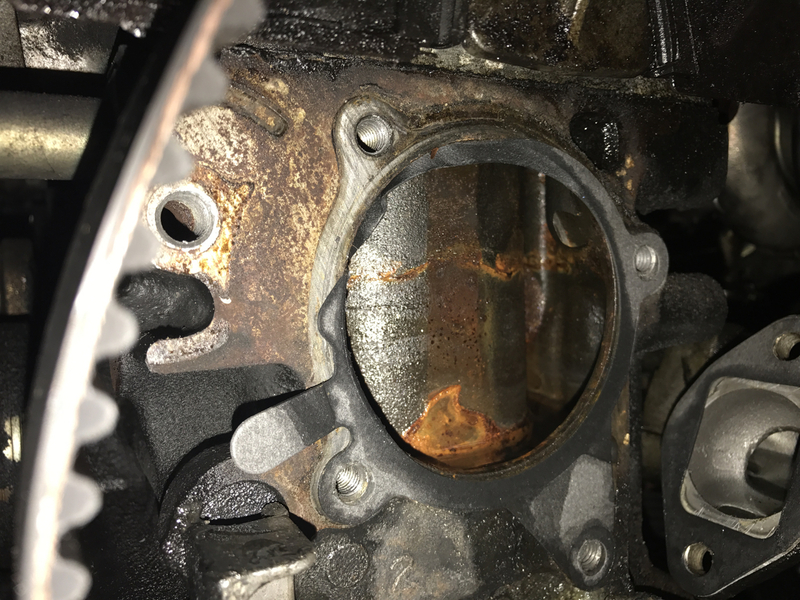 Note to self: Don't change water pumps at 2 a.m. This gasket was installed incorrectly. We put on a new gasket and buttoned everything up. 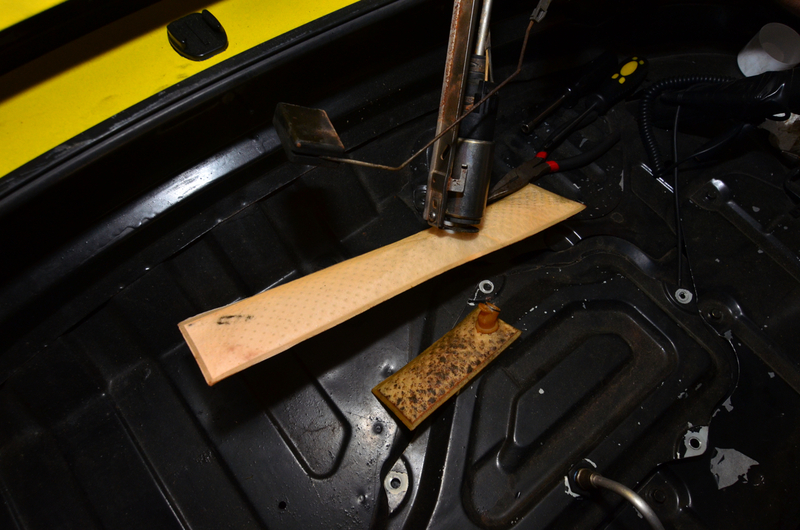 While the car was apart, we changed from the stock fuel pump pickup to a Holley HydraMat. This magic screen prevents our pump from sucking air during hard corners. Success! Once the car was running again, we plugged our laptop into our MegaSquirt PNP 2 to check everything and set the timing. 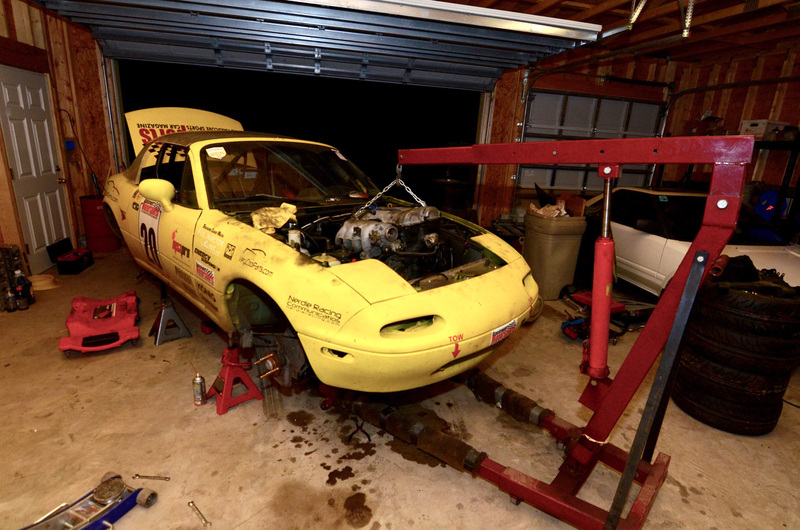 After a few nights of work, we had a running race car again. Time to clean the garage, bolt the wheels on, and load up for Daytona. 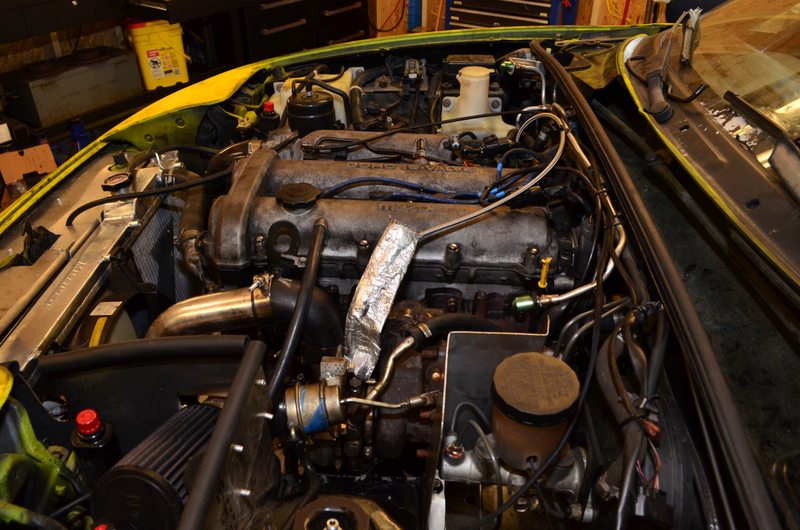 We diagnosed the problem as a failed turbo oil feed line, and started prepping our spare engine for installation. 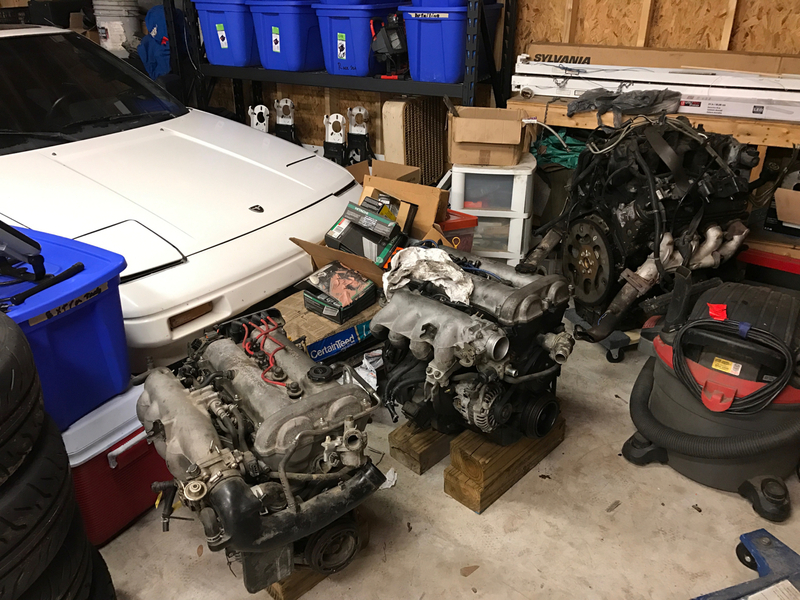 Oops: One look at the engine, which had been sitting in the back of a shed for years, and we realized it was a 1.6-liter Miata engine. Besides being down on displacement, few of our existing accessories would bolt on. So we started searching for a replacement. Fortunately, we didn’t have to search hard: Treasure Coast Miata had a good used 1.8-liter Miata engine in stock, and we had it the very same day. 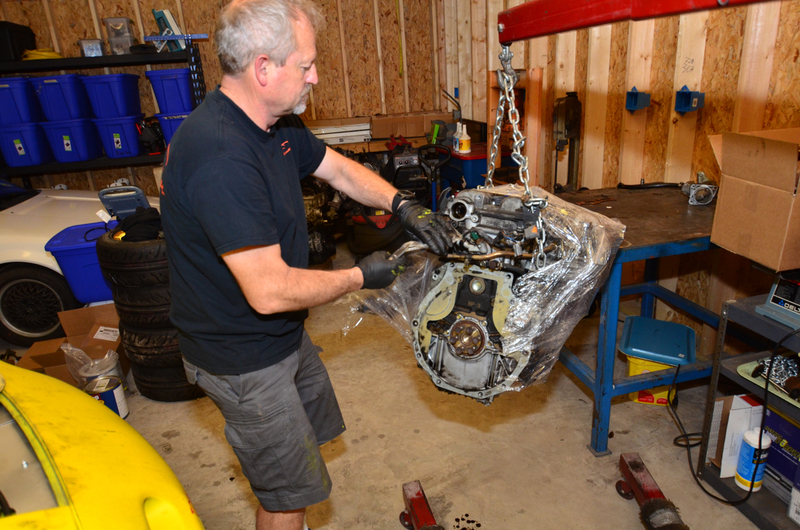 Check out the slideshow for a step-by-step of the engine replacement. 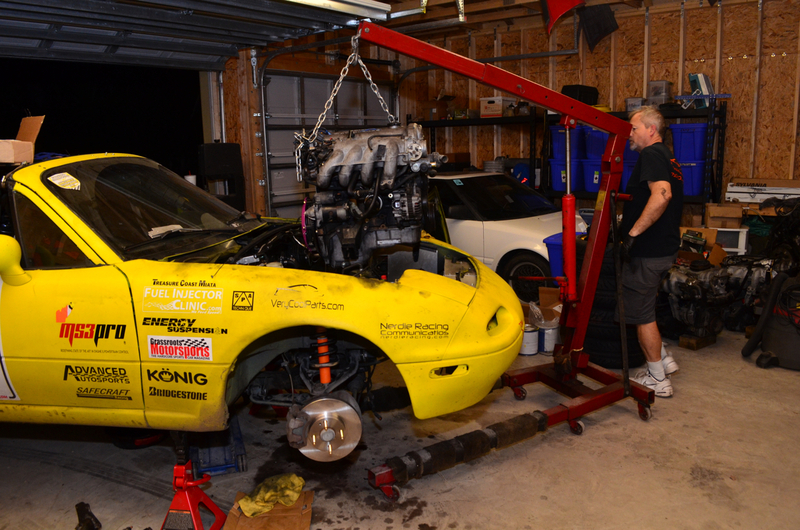 After a few nights in the garage, our Miata is back up and running. We haven’t had a chance to do any on-track testing, though, so we’re going into Daytona blind. Wish us luck on Saturday!